Stamina 1690 one of the most affordable power tower of good quality. Its cost on average is about a hundred dollars. In this review, we will consider in detail its capabilities, design features, possible exercises, advantages, and disadvantages. To prepare this review, we collected opinions of real buyers who shared their impressions of the use. So let’s start Stamina 1690 Power Tower Review. We hope it will be useful for you. Stamina 1690 has a simple but reliable steel frame. The kit provides everything you need to perform the Assembly and use the power tower. To perform the Assembly yourself, we recommend that you read and use the manual with step-by-step instructions for the Assembly. The process takes about one hour and is performed using standard tools. For greater stability of the frame is recommended to cover the floor mats. This will protect the floor surface and increase stability. It would be great if someone would help you. The manufacturer also showed the main training opportunities. Most importantly we recommend that you pay attention to the Heart rate zone table. There you will find information with what intensity it is recommended to train to get the maximum effect. First of all, as in any training, a warm-up is performed. It can take only a few minutes. Then you can perform exercises on their priority for you. Dips are designed to train your triceps, shoulders and chest muscles. It is important to observe the correct technique so as not to injure the elbows. Push-UPS using the handles allow you to perform the exercise comfortably for the wrists with greater amplitude of movement. Pull-UPS are an excellent exercise for the back muscles. In some cases, the power tower buy it for this exercise. This model does not have a back and armrests, which are usually used to perform Vertical Knee Raise. It is possible to perform lifts or holding the body leaning on the handle dips, or in the vise on the bar. Another exercise for the muscles of the press is Sit-UPS. It can be more convenient to perform leaned feet under the lower horizontal bar. You can devote about one hour to training. But it’s important to exercise regularly, and Supplement the workout with the power tower and other exercises. You may be interested in: the link is recommended to read the Power Tower Workout Guide 2019. Stamina has been producing fitness equipment for gyms and training at home for a long time. Its products always deserve attention due to good quality and affordable price. This model is not the only power tower in their catalog. It is perfect for home workouts. Its cost is quite affordable. It is not very functional but of sufficient quality. The frame is light and you can simply move it if necessary. The main structure is made of a durable steel pipe. The maximum user weight can be up to 250 lbs. When performing exercises, the strength of the tower remains stable and does not stagger. All handles with additional non-slip coating. The horizontal bar is located on the reverse side. This may require additional space. But it is convenient for high athletes who sometimes complain that when performing dips on other models, they rest their head against the horizontal bar. Perform pull-UPS conveniently different grips-narrow and wide, forward and reverse. This will make your training more varied and effective. You will be able to engage and train more muscles. 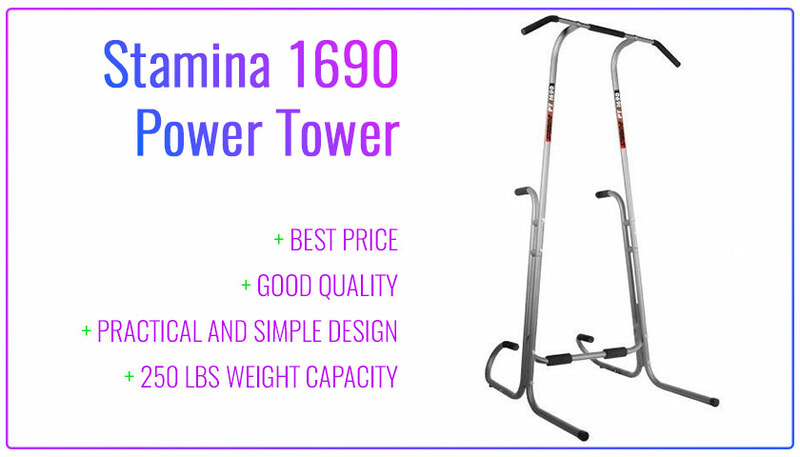 Stamina 1690 Power Tower is a great choice for home workouts with your own body weight at an affordable price. With this equipment you will be able to perform pull-UPS, push-UPS using handles, Dips, Vertical Knee raise. Weight Capacity 250 lbs. When you buy you get a good warranty. Hey All. Welcome to Gym Equipment Center. I am Michael Jones and I run this site with a small group of authors consisting of Personal Trainers, Health Professionals and sellers of fitness equipment. Our goal is to promote a healthy lifestyle and help beginners workout at home and in fitness centers. GymEquipmentCenter is a participant in the Amazon Services LLC Associates Program, an affiliate advertising program designed to provide a means for sites to earn advertising fees by advertising and linking to Amazon.com. 2011 - 2019 GymEquipmentCenter.com All rights reserved.